Your God demands a sacrifice... But it must be the correct one! 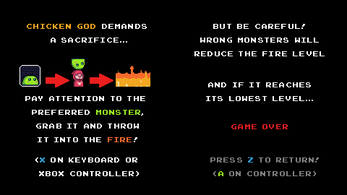 As a cultist who whorships the statue of the mighty Chicken God, Vib must offer monsters in sacrifice and throw it to the fire. But be careful! Chicken God is a capricious deity and it will only accept those sacrifices that it requires from you! You know, sacrifices must be made. 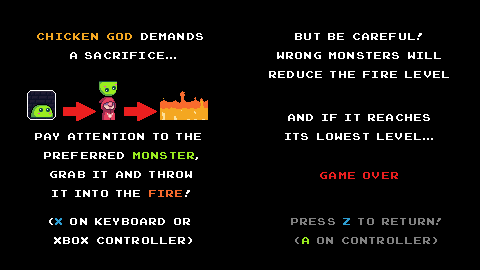 Your God Demands is a small action arcade platformer game that was developed in 72 hours during 43rd Ludum Dare by daruudaruu and Sapphiris. This is a LD project so we aren't asking for money. Just spread the game between your friends! But if you REALLY want to donate to us, we've set-up the download as pay what you want. But remember: this a jam game and it's totally FREE. Reach out to me on daruudaruu's and Sapphiris's Twitter pages. Also, if you follow daruudaruu, you will get some updates and news of new thingies and new projects. And if you did love the game, we'll be happy to hear about it! You can just leave a comment here too :). I wasn't very good at the game, but I saw some YouTuber who were pretty good at it. I thought that maybe the guys on the left only move to the right and vice versa, creating a possible loop hole; but you guys were ahead of me and I couldn't outsmart the game. Maybe the game is easier using a controller, but I only played it with a keyboard. The only minor issues I have are the controls of the menus (just let me use my mouse) and maybe the jump can be binded to the spacebar.